New Red Rock Range Bangle – copper & gold! 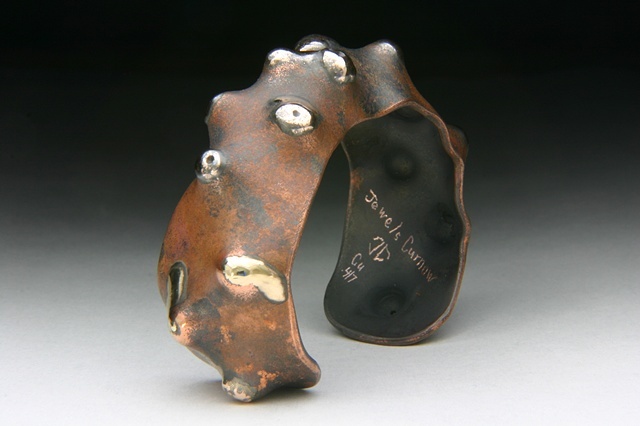 This bangle is made by hand using metal forging and fusing techniques. Lots of hammering! The fused gold is strong - 10 karat gold and will wear a lifetime. This bangle is beautiful on and comfortable to wear. Convo me if you have an questions. SIZE: 1 1/4” opening, widest inside dimension is 2 1/4”, height of inside dimension is 1 7/8”. Bangles average width is 1”. The bumps highest height is 3/8 to 1/2”.